So you would like to wash your car but you would like to do this ‘properly’. Finding that old sponge or chamois may not be the only things you need to replace. Here we look at finding that balance between what the professionals can afford and what equipment makes good practice to use at home. 1 x Pressure washer is strongly advisable but not essential, if you are keen about washing your car. These enable loose debris to be rinsed from the vehicle effectively under pressure before washing by hand. Machines can be either ‘cold’ pressurising water at the same temperature as the intake, or ‘hot’ where the water is heated in a boiler within the machine before being pressurised. Like washing your dishes at home a little warmth in the water not only makes the cleaning task much more effective it makes it a more pleasurable task. Hot washers can heat water to well over 100 degrees Celsius (°C), however we recommend that 45 degrees Celsius (°C) is a good, safe temperature. This is warm enough to soften grime and remove debris safely, any warmer than this and there is the risk of damaging the paint finish on your pride and joy. You have been warned! In terms of price cold are relatively cheap at £100 – £500 and hot washers are usually £1,000 – £2,000. 2 x Lambswool wash mitts. A typical yellow sponge can trap dirt and grit between the paintwork and sponge, scratching your paintwork in the process. We use and recommend using a Lambswool wash mitt. These allow dirt particles to be drawn into the deep pile away from the painted surfaces being washed. Since this is not matted wool, the dirt easily rinses out of the mitt. The thick pile holds a tremendous amount of soapy water to lubricate and protect the paint from potential swirls. Used with any high lubricity car wash, a genuine lambswool wash mitt will provide a safe, gentle wash on any vehicle. A product we use on a daily basis. They can come in all different manner of materials from cotton and synthetic blends to lambs wool and beyond. We would recommend lambswool. We recommend using two mitts, one purely for the upper body and the second only for the really grimy/gritty jobs such as sills and lower sections of the vehicle. 2 x Good sized, deep buckets. One for wash suds and the second for rinse. Rinsing the wash mitt in the second ‘rinse’ bucket will remove any grit particles which have been drawn into the deep pile of your wash mitt, rather than simply dragging it all over your vehicle – try it and you will be surprised at the difference in water colour of the two buckets at the end! Translucent buckets are best so that any dirt can be easily seen in the rinse bucket. Grit guards are for the real connoisseur where a specialist ‘mesh’ can be inserted in the bottom of both buckets to allow any grit to sink into a baffled section, thus preventing it being drawn back onto the wash mitt. 2 x Wheel brushes (1 x large, 1 x small). Most cars nowadays have alloy wheels making the car look great when clean. They can provide a slight nuisance when removing brake dust but it is not impossible. Two good quality wheel brushes in varied sizes will achieve good results, a large one for the main face and a smaller thinner type for between the spokes and back of the wheel. Do not be tempted to use your wash mitt on your wheels, unless you buy a dedicated one to only use on your wheels. At Windrush Car Storage we use four wheel brushes to achieve the best results as all of them have their uniqueness in size, shape and softness depending on the wheel type we’re working with. 1 x Good quality drying towel. Drying your car after washing will leave it with a beautifully smear and spot free finish. Soft and ultra-deep pile are far more absorbent than a traditional leather, capable of absorbing many times their own weight in water. The ultra-soft fibers significantly reduce the risk of causing surface marring when a drying towel is drawn across painted surfaces, allowing any particles to be pulled away from the surface safely into the towel. A generous sized drying towel will allow you to dry most cars without needing to wring it out even once. These are machine washable for use safely time and time again. For more information on how to wash and dry your vehicle the correct way please see our separate advice articles. A good quality car wash ‘shampoo’ is the best thing for the paintwork. 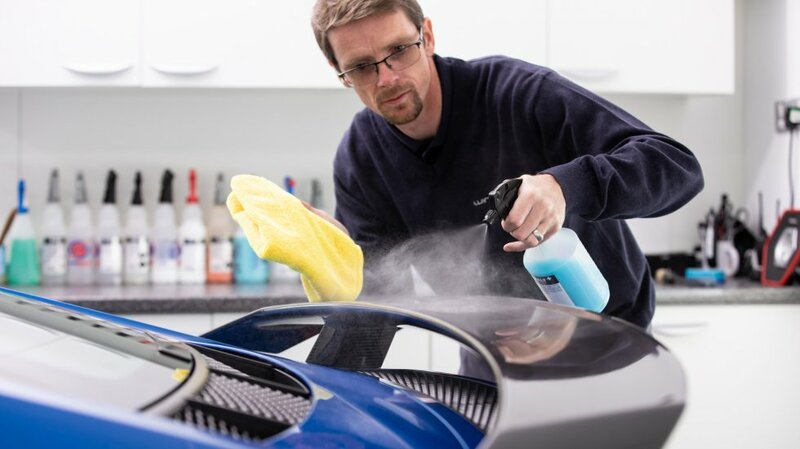 Do not be tempted to use household detergents as these will strip any protective coating from the paintwork and leave the bodywork unprotected. Most good car product brands will sell shampoo and conditioner; this is car shampoo with a simple rinse aid. These are safe to use on the bodywork, cleaning the surfaces gently without stripping wax or paint sealant. Alloy wheel cleaner. If you regularly wash your vehicle a separate alloy wheel cleaner can be avoided altogether as any dirt on your wheels can be safely washed with car shampoo. However if your wheels have been left for a while between washes it may be time to invest in a good quality, dedicated wheel cleaner. These are better suited for removing baked on brake dust than car shampoo. The strongest wheel cleaners contain acid and whilst these do a great job at cleaning your wheels, as you can imagine are not going to be ‘good’ for your wheels in the long run. If you do decide to use a wheel cleaner look for a non-acid type which will be kinder to the surfaces of your wheels. Always read the label to ensure the product can be used with your wheel type. All of the tools and products outlined above are used at Windrush Car Storage on a daily basis. So many people simply don’t spend enough time or money investing the right tools for the job and believe a bucket, sponge and chamois are all they need. Whilst yes you can wash your car with these it will be hard work, not half as enjoyable and most importantly not ‘good’ for your car. At Windrush Car Storage we carefully wash and dry every car which comes into our car storage facility, whether everyday or classic car storage we treat every vehicle with the same level of care and attention. This allows us to ensure that any contaminants have been removed from the vehicle during the wash process and also gives us a good opportunity to inspect the condition of the vehicle fully.